“Everything that slows us down and forces patience, everything that sets us back into the slow circles of nature, is a help. 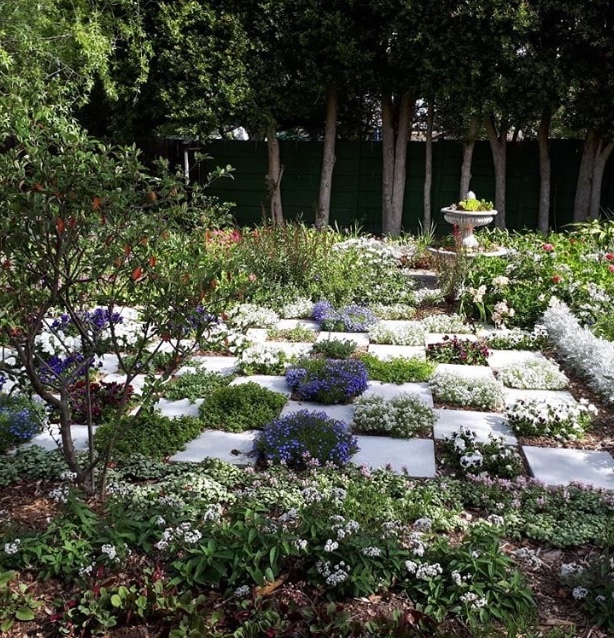 Gardening is an instrument of Grace.” May Sarton. I’m not sure why but I seemed to lose the blogging plot somewhat last year. For those of you who’re interested and have been asking, here are some before and after photos of the garden. 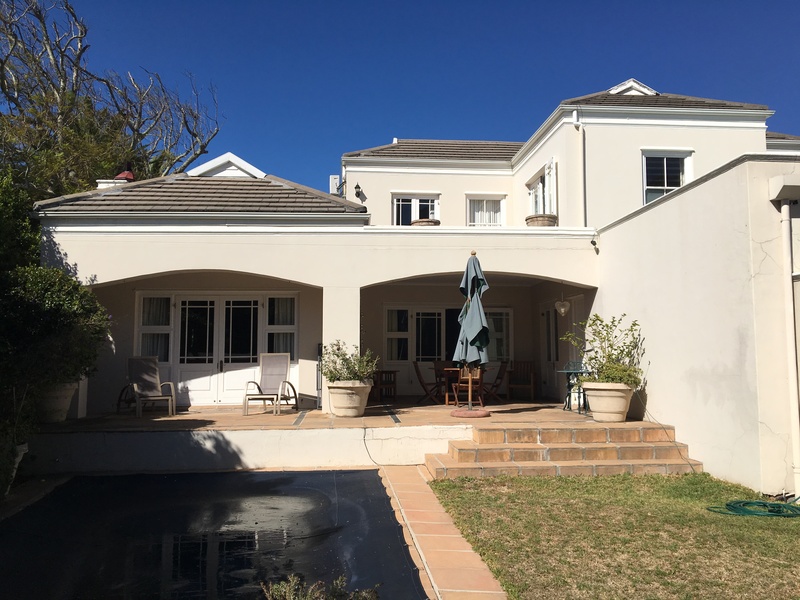 We started off with a raised veranda area and three steep steps down to the lawn and pool level. 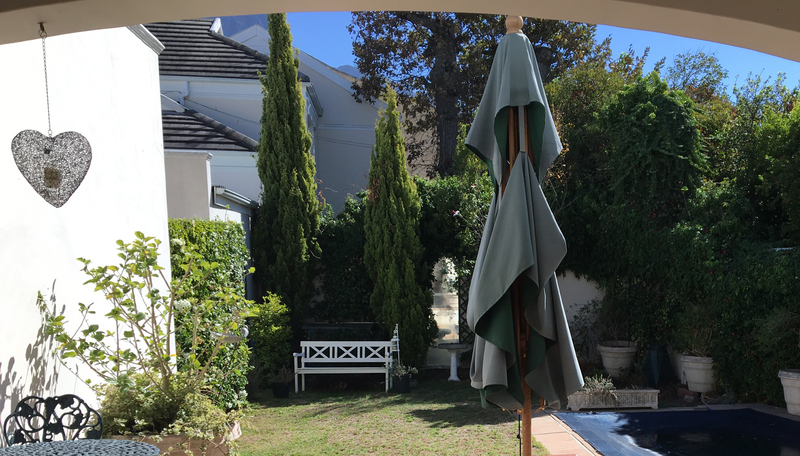 Having learned from our Parkhurst home what a difference it makes to both flow and visual impact to have everything on more or less one level, we decided to raise the whole garden up to the height of the veranda. The garden was dull with a strip of lawn surrounded on three sides by narrow beds of shrubbery. Below are the ‘Before’ pictures. All three photographs show the fading lawn, struggling to survive the lack of water. 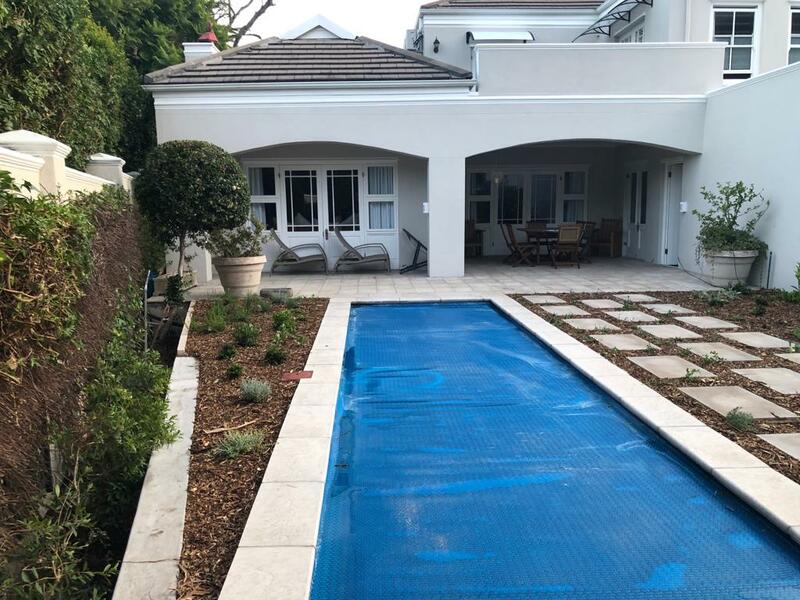 With the ongoing drought in the Cape and severe water restrictions, we decided to install two water tanks and to plant a water-wise garden as far as possible. 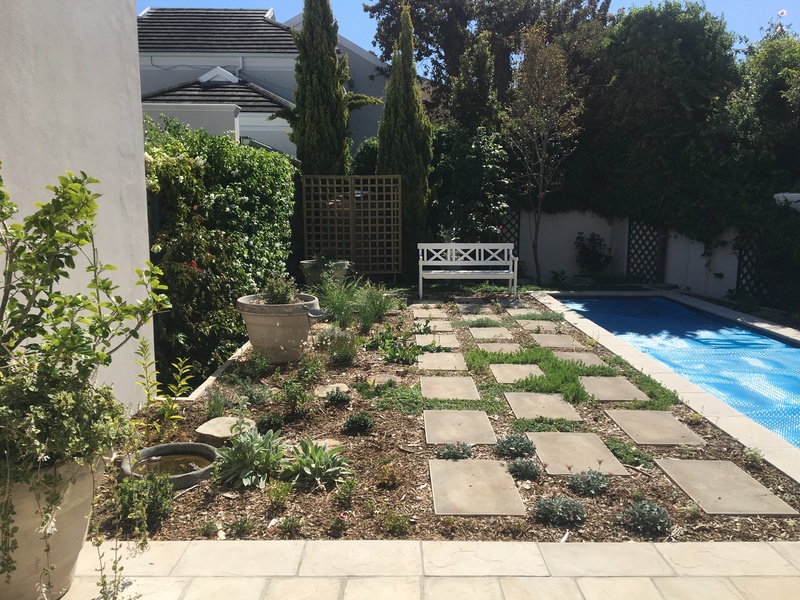 I have a great friend in Cape Town, Liz King, who wrought miracles with her garden when she got rid of a flat, thirsty lawn and transformed it into an interesting, breathtaking space using pavers and ground covers. 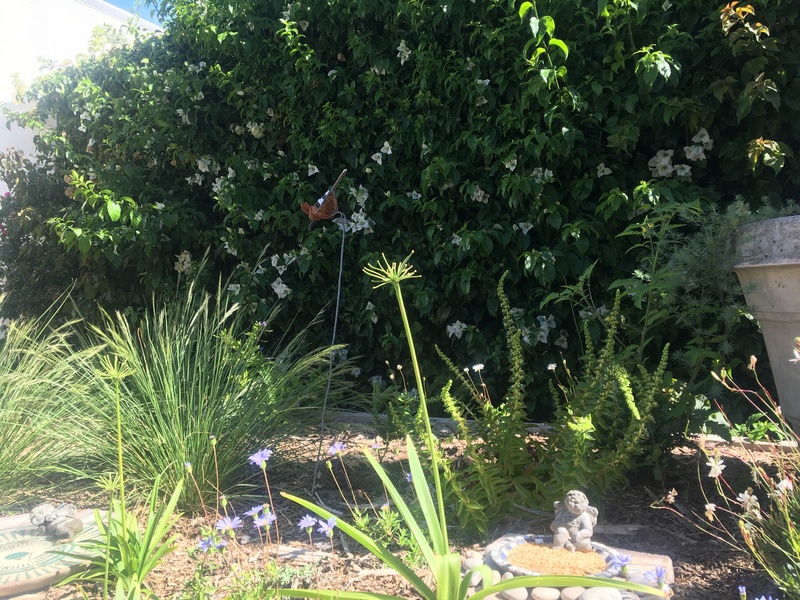 She and her garden have been my inspiration for the changes I’ve made to my very compact space and she’s given me help and advice along the way. 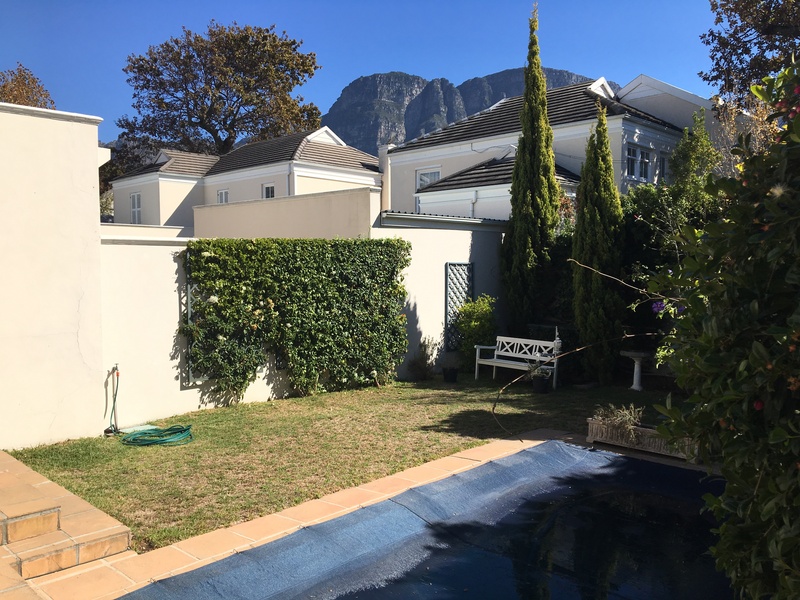 Below is a photograph of her beautiful Rondebosch garden. This stage of a building/alteration project can be a little daunting. 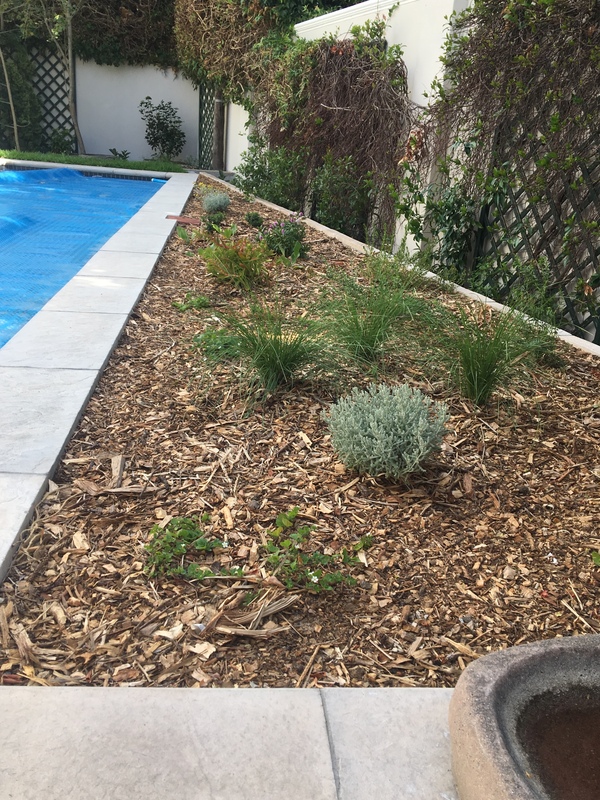 In the pictures below, you can see the ‘trenches’ left around three sides of the garden. This was done for the survival of the established climbers, shrubs and trees planted against the walls. 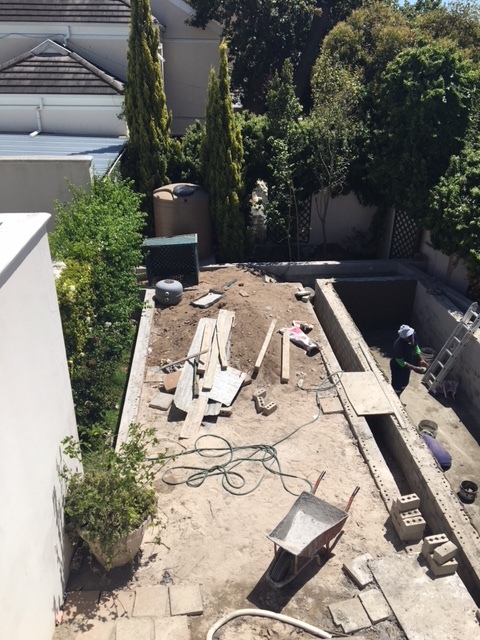 Our builder contractor got the process started, bringing in filler and top soil in December, levelling the space and laying the first of the pavers so as to allow us to get from on end of the garden-to-be to the other. 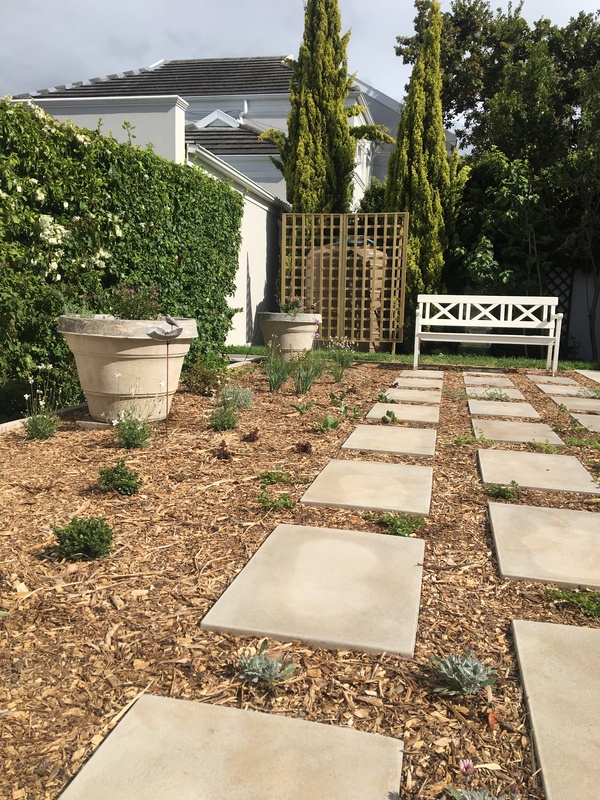 In January, Sean Newberry of New Space Landscaping, brought in his team and made a start with the planting of indigenous, hardy ground cover and shrubs, before spreading a thick layer of mulch over the surface. 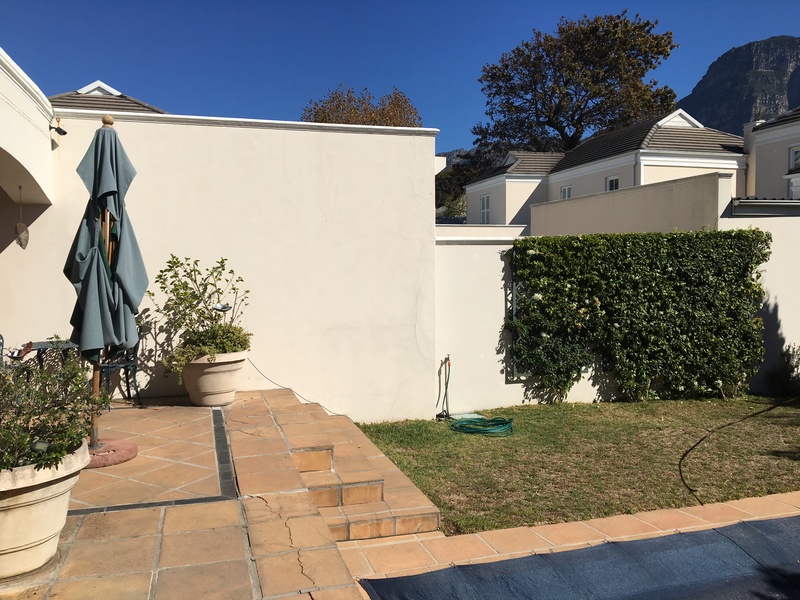 Sean also connected our disused sprinkler system to the two new water tanks, making it possible to water the garden using stored rain water only. 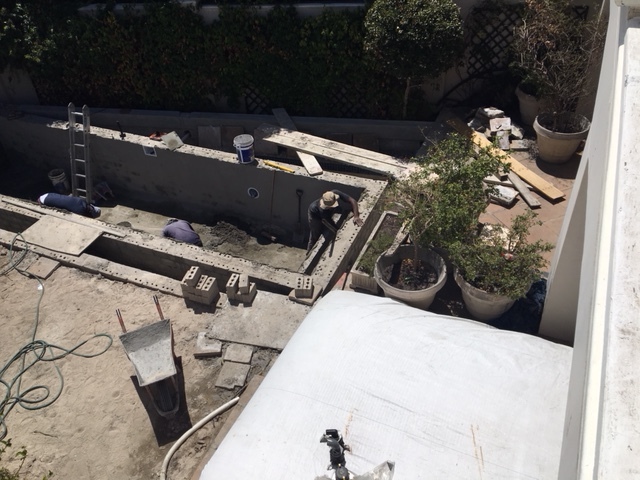 He erected the screen in front of the visible water tank and we hope it will soon be covered in creeper. 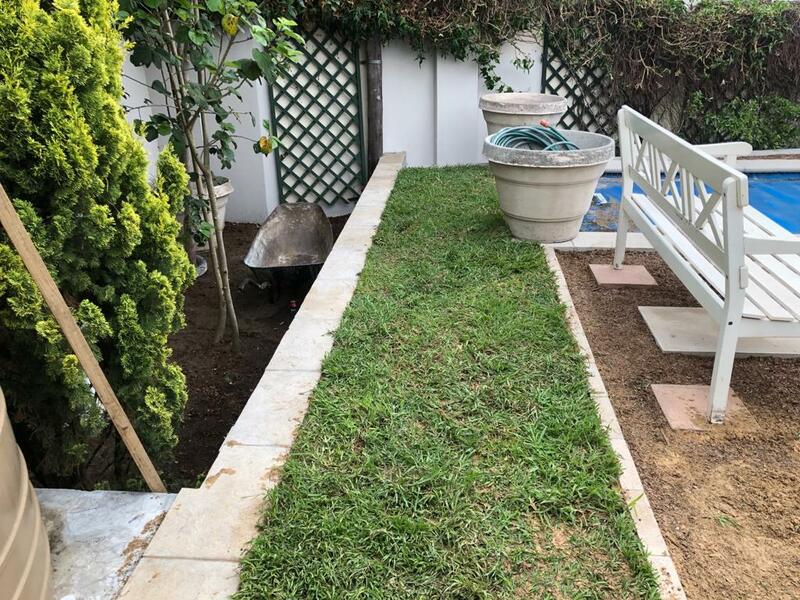 Because we often visit Cape Town with ‘Daisy Dog’, the strip of lawn was laid with her needs in mind. If the drought persists and the grass struggles, it is at least almost out of sight. As far as possible, I’ve chosen indigenous plants in Cape Town in the hope that they will survive heat and drought. This is a new direction for me, having always leaned towards English gardens. In its original guise, this garden had little or no birdlife. In just four months it’s been gratifying to welcome quite a variety of birds into this compact area. Instead of only a few doves, we are now visited by Cape Robins, Thrush, Sunbirds and Bulbuls. I hope that as the garden becomes more established, there’ll be even more. Everything added to the garden since January, I have done myself and along the way I’ve been reminded that having a small garden I can more or less manage alone is more fun – and in many ways more satisfying – than having a big, overwhelming one. 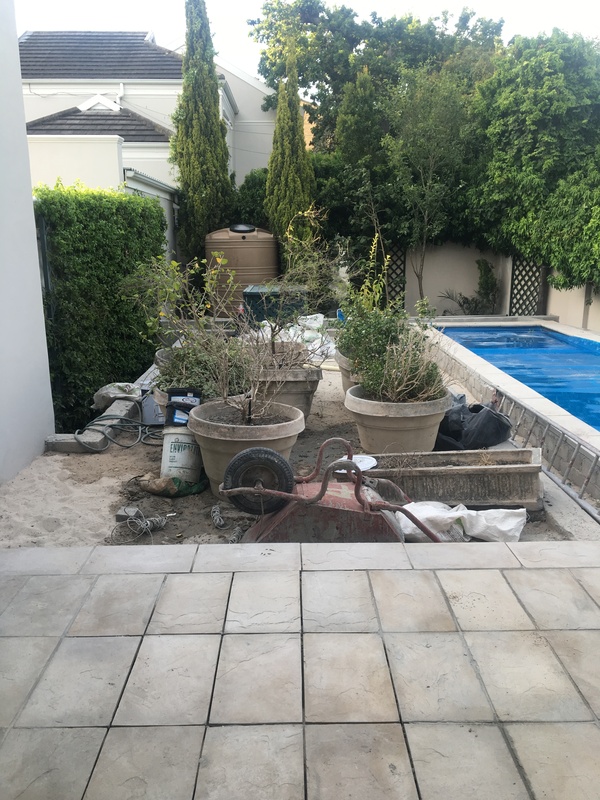 The first thing I do on arriving in Cape Town is to step outside to check on progress and it’s the first thing I do on arriving home. I am torn between two gardens. The Welsh poet, W H Davies summed this up when he wrote that ‘the more help a person has in his garden, the less it belongs to him.” There is something immensely rewarding about bulbs and seedlings I’ve planted myself, emerge into sunlight and flourish.